ENTEBBE – Gorilla Conservation Coffee (GCCoffee) is a social enterprise working to save Uganda’s endangered Mountain Gorillas. GCCoffee is a brain child of Conservation Through Public Health (CTPH), a nongovernmental organization. PML Daily’s Abraham Mutalyebwa spoke to CTPH Program Manager, Dr. Innocent Djossou, and Richard Bagyenyi, Program and Communications Assistant who shared their enterprise’s journey. Briefly tell us about Gorilla Conservation Coffee. Gorilla Conservation Coffee is a social enterprise that started in 2015 to give an alternative livelihood to the communities living around Bwindi Impenetrable Forest so that they don’t poach in the park and destroy the habitat of the mountain gorillas. Conservation Through Public Health was started in 2003 by Dr. Gladys Kalema-Zikusoka who was doing her research and realised the need for improving the quality of life for both people and wildlife to enable them to co-exist. Why does Gorilla Conservation Coffee address this and no other issues? As GCCoffee we zeroed down on this because of the need to conserve biodiversity and make sure that the forest is kept in its original state. We found coffee growing one of the best alternatives that will help us to address this situation compared to other activities. The communities around Bwindi have embraced it with open hands. GCCoffee is currently only buying coffee from farmers in subcounties bordering Bwindi Impenetrable National Park. What is so special about Gorilla Conservation Coffee that encourages coffee farmers to join you? We offer premium prices for good coffee thereby providing the farmers with a steady market and steady prices. We have started with Arabica coffee because it is highly favoured around the word. The farmers get 0.50 cents per kilogram of green coffee above the market price. Furthermore a donation of $1.50 for every bag of roasted branded coffee goes to support CTPH’s community health and gorilla conservation work within the same farming communities. Our consumers are told about this and are happy to contribute to this. Apart from growing coffee which other activities do the local communities do? The local communities carry out other activities like animal rearing and growing other food crops though we encourage them to grow crops that won’t attract Gorillas to their farms. Crops such as bananas so that there is co-existence with the Mountain Gorillas and the locals. What measures have you taken to make sure that this initiative is sustainable? Tell us about the support you are giving these people. Gorilla Conservation Coffee has been set up as a for profit social enterprise. A donation from every bag of Gorila Conservation coffee sold goes to support Village Health and Conservation Teams (VHCTs) who are community volunteers endorsed by the government and supported by CTPH to provide health services within their villages. They are good-will ambassadors that promote good health and hygiene practices, family planning, good nutrition, sustainable agriculture and conservation of the gorillas and the forest they live in. The VHCTs also refer community members who are suspected to have infectious diseases like TB, Scabies, Ebola and many others which could be transmitted between people and gorillas. How many local communities/farmers are part of Gorilla Conservation Coffee and what impact have you had in the villages? Apparently, we are working with about 85 farmers and more are getting on board after seeing the transformation their fellow farmers have gone through, especially improvement in their welfare since their coffee is bought at a higher price than the prevailing market. Secondly, they are getting to appreciate the value of these forests and the mountain gorillas’ contribution to tourism, because they sometimes meet gorilla trekking tourists who visit their farms during coffee safaris. The area has developed and people are gradually constructing decent homes which is an indicator in improvement in people’s welfare. Which countries do you export your coffee to and how do you market it? Our first coffee blend is “Kanyonyi” a name we got from the lead silverback of one of the Mubare Gorilla group, one of the favourite gorillas of our founder Dr. Kalema-Zikusoka. Our coffee market target are the tourist lodges, hotels and gift shops not supermarkets. 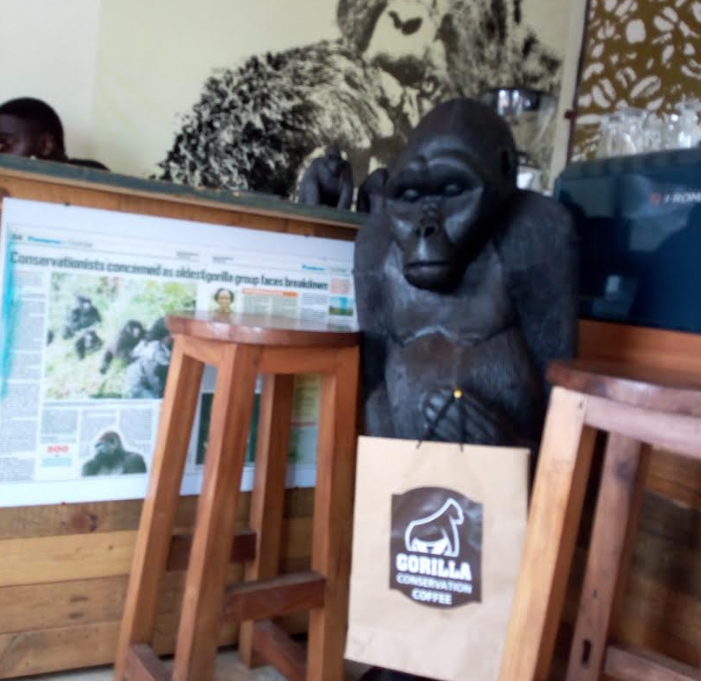 Coffee lovers can also extend their tourism experience at our Gorilla Conservation Café in Entebbe. We export our coffee all over the world and have buyers in New Zealand, US, Canada, South Africa and the European Union because of our initiative. The buyers are really happy to support this noble cause. Coffee contributes immensely to Uganda’s economy. What are you doing towards this? By creating a global coffee brand linked to gorilla conservation, we are encouraging farmers living around gorilla habitats to take coffee growing as a serious livelihood that will cause a transformation in their lives and the communities around. Which partners have you worked with that have helped towards this noble cause? As I told you, we are working closely with Conservation Through Public Health, a mother non-governmental organisation and Uganda Wildlife Authority, we are also working closely with the local authorities down in the villages so that they own it. We buy coffee from farmers in the Bwindi Coffee Growers Cooperative that we helped to establish. We thank all our partners for the great work done to make this possible. What is your last word for the farmers and the country at large? 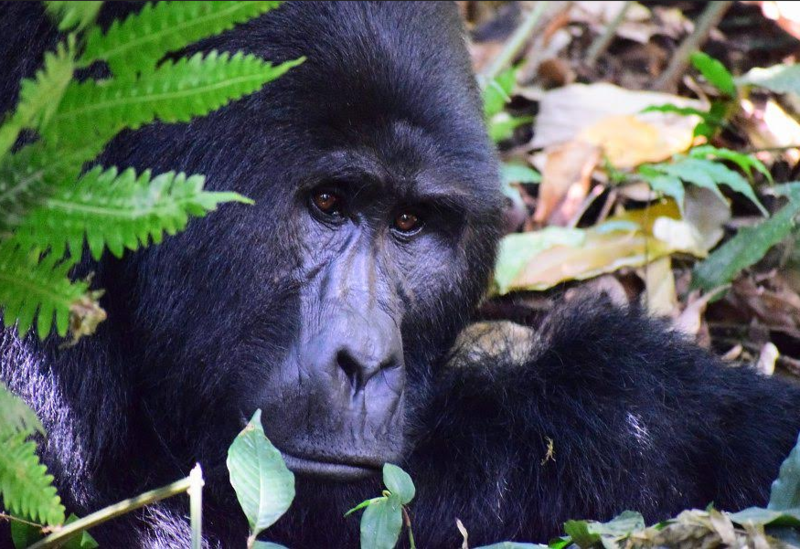 Mountain Gorilla tracking is one of the most sought for tourist attractions in the country, which helps to validate the reason to protect and conserve this endangered species.